you may have seen the tv commercials from tampax and always about young girls in areas of africa that are often unable to attend school during their time of the month due to inadequate feminine hygiene supplies. apparently these big companies have offered their products to these girls. but, what if we instead supplied these young girls with reusable cloth pads~ pads they can wash and use, over and over and over. i recently came across the goods 4 girls organization and their goal is to do just that! through donations they hope to provide reusable menstrual supplies to these girls who would otherwise be using newspaper, rags, camel skin or nothing at all. providing disposible supplies to these communities causes additional burdens to their enviroment and living conditions. want to donate? it is easy! visit the donation page of the goods 4 girls site and you will be given links to several shops that sell cloth pads as well as a pattern page for those who would like to sew cloth pads to give. as soon as i can wrangle an afternoon to sit at my machine i am going to sew some pads to donate. want more enlightnment on this subject? read more about it at blogher. in the spirit of The Motherwear Breastfeeding Blog asking "what's so funny about breastfeeding?" i thought i would share this little bit of breastfeeding hilarity! enjoy! 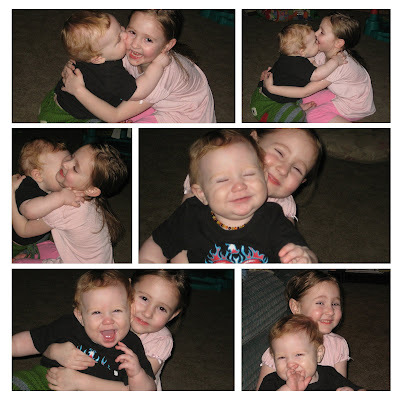 i will always remember these days, when they are little and still love hugs and kisses. when they fit nicely in my lap for story time, one on each knee. when their faces light up when they see each other in the morning. when they seem to have a special language that only they can understand. when they are the most important people to each other. i took a care package to my friend monique who slipped and broke her ankle earlier in the week. please stop by and wish her well! we decided to set up the crib in our bedroom so harper can sidecar next to our bed. he still co sleeps with us but i want to be able to lay him down for the 2 or 3 hours after he falls asleep until i am ready for bed. after a traumatizing first night (traumatizing for both harper and mama!) we went to the book store and bought a copy of "the no- cry sleep solution" i have been reading it every spare second and so far i love it! i will definitely keep you all posted on how it works for us. harper agrees that it was a very wise purchase! esme' was having a shy day and did not want her photo taken at the book store coffee shop. come on, can't a little girl enjoy her hot cocoa in peace without the paparazzi in her face??!! and, mom victoriously sneaks one quick photo in before she can hide her face in her jacket! one last thing, i will be stocking a few goodies at Majestic tomorrow! a meme for me and my sweetie! my blogging friend kim at prairie mama tagged me with this valentine meme and, slacker that i am, i am just now getting around to posting it!! so here it is, everything you ever wanted to know about tony and i! How long have you been together? 10 years! How long did you date? we dated for 1 year and were engaged for 1 year. Who eats more? uh, he does!! Who said “I love you” first? he did, after our first disagreement! Who is smarter? definitely ME! Who does the laundry? i do laundry for myself and the kids and he does his own laundry... he even irons!! Who does the dishes? mainly me, or the big kids. Who pays the bills? tony does and i have to say i am just now kinda getting used to it. it is hard for an independant mama to let someone take care of such things! Who mows the lawn? tony, i have major fears of the lawn mower!! Who cooks dinner? we both cook~ lately i have cooking more. Who kissed who first? um, i think i kissed him! Who asked who out? i really don't know! Who proposed? tony did~ we were camping! Who has more friends? me, but my friends love tony too! Who has more siblings? me, i have 2 brothers and tony has one brother who passed away the year we were married. how cute is this?!! i just got the pattern today. let the fabric hunting begin! this is juliet, knit in cotton ease. this was a super quick, fun knit. i may even knit another one in a different color, and a size smaller~ this one is a little bigger than i would like. i was shopping at target earlier this afternoon and saw some little cropped cardis very similar to this one... but not nearly as cute! and some handmade stitch markers. the bottom set went into heidi's yarn ball and the cocktail set was made for another friend. our first onbuhimo~ we are in love! i thought i would post an update to the big push for midwives campaign here in idaho. on wednesday the House Health &Welfare committee held a closed "print hearing" where they agreed to print our bill. now it will go to the printer, be assigned a house number and be available for everyone in the world to see on the legislative website - http://www.legislature.idaho.gov/. next we will be given a hearing date with the House H&W committee where we provide testimony. when it passes out of the committee it will be heard and debated on the floor of the House of Representatives. once it passes the House we go through the same process on the Senate side. amy at crunchy domestic goddesss wrote a wonderfully informative post last week in an effort to share this message and get the word out to as many people as possible. 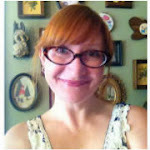 i encourage you to stop by and check out some of the great links she has provided! i spent the weekend preparing a letter of support to send along to the House Health and Welfare committee. as i have mentioned in previous posts supporting midwifery and making sure it is always an option for myself and other women is very important to me. i want a midwife's care to be an option for my children, and my children's children, and long, long after that. visit the big push for midwives to learn more about the big push and see what you can do to help! share your midwife assisted birth stories with anyone who will listen and encourage them to support midwives as an important option for moms and babies! harper's birth story can be read here and esme's birth story was printed in the summer '05 issue of compleat mother magazine. someday soon i will post it here as well. i am coming back to edit this post because i got to thinking that a lot of moms and families can probably benefit from hearing about my 2 hospital births too. i was very fortunate and had fairly natural, intervention free hospital births. i was not nearly as educated about my options back then nor did i have the wonderful support i was blessed with for my last two births. i will work on getting those birth stories written up, to the best of my memory! i hope to have photos of all my crafty adventures up this week... so stop back by very soon!